So The Husband and I often joke when the girls are being difficult that they got those annoying traits form the other one. For example, the Big One is very black and white. She is not flexible and doesn’t allow wiggle room on most things. I find this to be terribly annoying, so it’s most definitely something she got from The Husband. The Husband, the Big One and I are all fighting a cold or something. 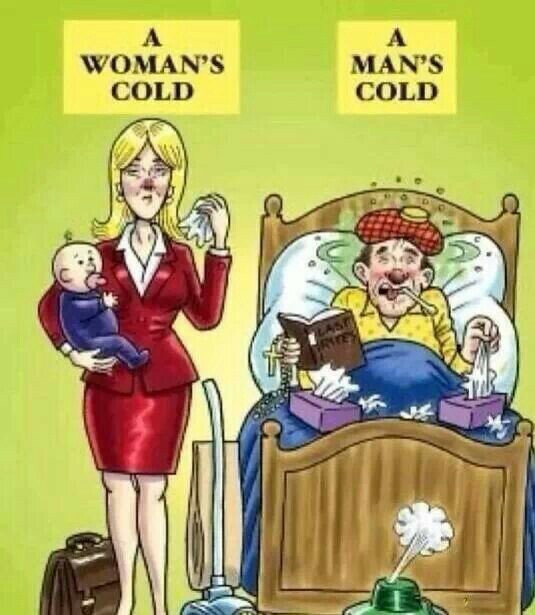 I am the mom, obviously, so I cannot get sick. It’s not an option. So I am fighting with all that I’ve got to stay well. 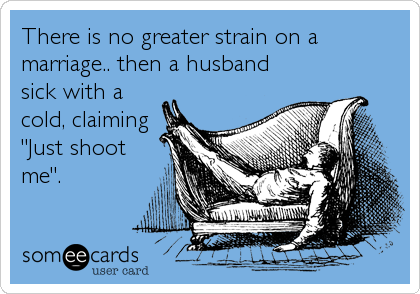 The Husband started with a sniffle and is now, of course on his death bed because of a stuffy nose. The Big One is like me. That kid is a fighter. This morning, I heard her alarm go off, but didn’t see movement from her room. So I opened to door and noticed that her ceiling fan was on. I said, “huh, why is your fan on?” To which she replied, “I was really hot last night so I turned it on.” Mind you it’s probably about 68° in that part of the house – far from hot. “Uh-oh, sounds like you’ve got what Daddy has,” I said. “NO! I am NOT sick!” she replied. So I told her it was time to get ready for school and left the room. I went in to my bathroom to dry my hair. She came in to use the potty. She sneezed, followed by a few seconds of a hacking cough.I just looked at her. Exasperated, she says, “My throat hurts just a little when I cough or sneeze. And my chest sort of tickles every time I breathe…. But I AM NOT SICK!” With that she stomped out of the bathroom and got ready for school. So there you have it, complete denial about being sick. Yep, she is my child. And yes, again I am the worst mom ever and let her go to school.